February brought snow, frost and fog. With a few runners on the all-weather LADY COSETTE (3yo) made an eye-catching racecourse debut for the yard when just beaten into 2nd place at Wolverhampton first time over an extended trip. Credit to Ian Rogers her regular rider who has been very patient with her and was so nearly rewarded with a win. This stunning daughter of Wootton Basset holds French Premiums and may well cross the Channel this turf season. The older horses are all being stepped up in their work in preparation for the start of the Turf Flat Season – Doncaster 30th March. It is with great sadness to announce the death of Peter Bailey. Peter was a member of Susan Abbott Racing partnerships with various horses. He was a much respected and admired trainer whose career spanned 26yrs with notable victories at the Cheltenham Festival - Hal’s Farewell (1968 Grand Annual Chase) & Canasta Lad (1974 Arkle Chase) as well as training Strombolus to win the 1978 Whitbread Gold Cup, Zeta’s Son to win the 1976 Hennessy Cognac Gold Cup and Canasta Lad to win the Welsh Champion Hurdle 1972 & 1974. Peter also had links to Windsor House Stables when he was assistant trainer to Peter Walwyn. Our thoughts and prayers are very much with his wife Jane and family. Bay filly sister to multiple winner Moneycantbuymelove & 3rd in Nassau Grp1. £1,000 per share 30 share lease partnership with just 3 shares left! In July 2018 William’s grandfather John Dunlop died. 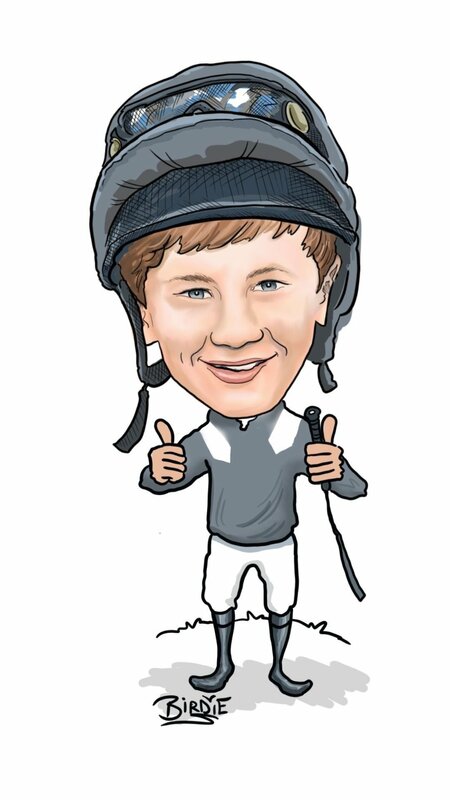 William (11yrs) is keen to honour his memory and has decided on 7th September 2019 to take part in the Sussex Classic South Downs Bike Ride over 78 miles in one day raising monies for the Injured Jockeys Fund. This was an idea he came up with himself. Throughout the year he will be hosting some fun events for people to take part in with monies raised at these events all going towards his sponsorship target. He will be accompanied on his bike ride by his lycra clad father! They are already in training. All donations grateful received. www.virginmoneygiving.com/WilliamDunlop2 cheques made payable to IJF. The first fundraising event is The Biggest Football Match Ever…! 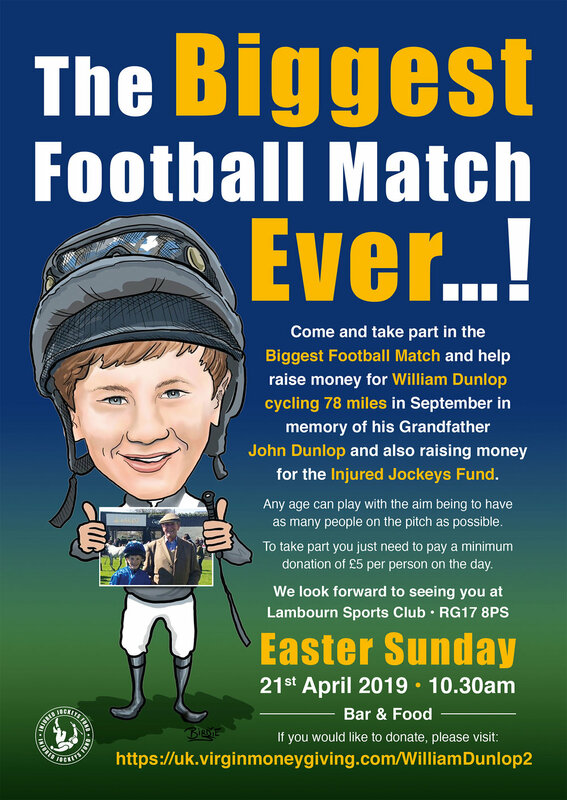 Easter Sunday 21 April 2019 at 10.30am Lambourn Sports Club, Bockhampton Road, Lambourn Come along and take part in the Biggest Football Match. Any age can play with the aim being to have as many people on the pitch as possible. To take part you just need to pay a min. donation of £5 per person on the day. January saw very little racing action on the all-weather with the majority of horses back from their holidays starting canter work. It was great to see COASTAL CYCLONE (5yo) return to the track and finish 4th just beaten half a length by the winner. We are very proud to have been awarded a 2-star status in the Lycetts Team Champion Award 2018. There was a large entry in both sections of the competition, one section was for racing yards with 40+ horses and the other for racing yards with 40 or under horses. The assessment criteria for Lycetts Team Champion Award were based on The Winning Approach, a best practice standard developed for the National Trainers Federation by consultants Sport and Beyond. They included effective recruitment and induction systems, a safe and positive working environment, developing staff to fulfil their potential, and rewarding achievement. The top rating was 3-star something we will be aiming for in 2019. Well done to all the staff members for working hard and contributing to Harry Dunlop Racing! £1,000 per share 30 share lease partnership with just 4 shares left! We are very pleased to say our nomination was of a very high standard and we earned a 2-star rating denoting that the yard has very good levels of team ethos and staff engagement! We are proud of our staff with the contributions that they made to progress with this award and we thank Lycett Insurance Brokers & the National Trainers Federation for sponsoring this award. Hopefully we can go one better next year! Happy “Official” Birthday to all the Horses! December was full of Christmas cheer. A huge thank you to all connections who gave so generously to the Staff Christmas Box. This was very much appreciated by Phil Wright and the team who work so hard in whatever the weather might throw at them to make sure all horses are happy and content. Happy Horses makes a Happy Trainer! This month saw the arrival of quite a few yearlings from various nearby pre-training yards including Hetta Stevens and Mark Grant. It also is the time of the year when these young horses need to be formally named. Some owners like to do it themselves whilst others like to set the challenge to Tom and William which can have interesting results! Tom’s best named horse to date was Red Tornado who was a multiple winner & placed at Grp3 level whilst William has failed to get off the mark with a winner – Incredible Thunder sadly didn’t quite live up to his name! Bay filly sister to multiple winner Moneycantbuymelove & 3rd in Nassau Grp1. You don’t have to be a keen cyclist to join but it does have the added bonus of additional organised bike rides inc. Deauville 2019 – this could be part of the fitness NY resolution! Wishing you a very Happy & Healthy New Year with plenty to celebrate preferably in the winner’s enclosure! Join Harry at Arqana October sale where he will be looking for another Jackfinbar! September saw more BLACK TYPE results! Flag bearer ROBIN OF NAVAN (5yo) looked in fantastic shape at Maison-Laffite where he just missed out on winning yet another Group 3 when caught at the line to finish 2nd to a very good filly Golden Legend. He always gives his best and added yet more euros to his overflowing pot bringing over 700,000 euros in prizemoney won to date. PACT OF STEEL (3yo) rewarded his owners with a fantastic WIN at Lingfield Park over 1m2f. Last time out he had finished 2nd over 1m 1.5f and the extra half furlong was enough to help record his first win. Delighted for connections and for the team at home all who believed he had the ability to be first past the post. One of the highlights of the year so far had to be watching SPACE TALK (3yo) finally get her nose in front and WIN at Lingfield Park. Earlier in the month she was 2nd by a nose and this time she reversed the placings under a nerves of steel ride by Nicola Currie coming off the pace flying down the outside to reach the line in the shadow of the winning post. Congratulations to Mr Kurt and the team at Kurtsytems and Kingwood Stud. LOOKINGFORCARL (3yo), a handsome son of Loup de Vega returned to the track after a summer break to finish 2nd over 1m4f at Kempton Park beaten just under a length. At the end of the month he returned to Kempton Park where he WON impressively over 2m for very patient owners Haven’t a Pot. He will be a lovely stayer for next season. CRACKAWAY (2yo) made an eye-catching racecourse debut at Salisbury running on well to finish 4th in a competitive maiden. He was bought at the Arqana October Sales and therefore qualified for the Sales race on Arc weekend at Longchamp where first prize was 137,000 euros with monies down to 8th place. His sporting quartet of owners decided to give this son of Whipper a chance to return to France and he rewarded them by picking up prizemoney and a wonderful day out racing in Paris. Once he has grown into his frame he will be an exciting prospect for 2019. BALLET RED (2yo) finished 4th at Kempton and now mostly likely will make the trip across the Channel to plunder euros for her owners The Ascot 9. Another 2yo to make an eye-catching racecourse debut was CRANEUR (2yo) at Salisbury for the Be Hopeful Partnership. This good-looking son of Showcasing has taken a while to mature and come to hand and it was lovely to see their patience rewarded. KNIGHT TO BEHOLD & ROBIN OF NAVAN headed to Paris Longchamp for the Prix Dollar Grp2 (1m2f) and Prix Wildenstein Grp2 (1m) respectively. Both very competitive races as expected on Arc weekend and unfortunately after the re-development of the track the ground conditions were extremely inconsistent and didn’t suit either horse. This was a compliant echoed by many other jockeys and trainers. This was most disappointing as both horses in good form, but it was a fantastic achievement to end up with 3 horses including Crackaway running at the Arc meeting from a team of 35 horses. Harry would like to thank so many of you for your extremely kind words about his late father John Dunlop. He has been inundated with cards and letters full of wonderful memories of fun times. The thanksgiving service had a huge turnout and both Simon Crisford and Sir Thomas Pilkington delivered both entertaining and moving addresses. The main yearling sales focus is now at Newmarket where Harry will be busy working to find more winners who qualify for the various sales bonus races. Harry will be attending most of the sales to see if he can uncover another Robin of Navan or Jackfinbar. If you’d like him to look for a horse for you just give him a call on +44 (0)7880 791 895. Everyone is invited to attend the annual owner’s day to include Parade of Horses & Yearlings followed by Lunch. This is a great opportunity to see friends, make new acquaintances and view the current champions and see possible champion of the future. Please let the office know if you are able to attend. info@harrydunlopracing.com / Jenny 01488 73584. As all owners know, Group races at any level are incredibly competitive and hard to win. Within two weeks Harry struck gold in France winning a Group 2 & a Group 3 worth a total prize fund of 280,000euros. Harry’s strong faith in KNIGHT TO BEHOLD (3yo) was justly rewarded in Deauville when this handsome son of Sea the Stars out of Angel of the Gwan bolted up in the Prix Guillaume d’Ornano Haras du Logis Saint-Germain Group 2. Dropped back to 1m2f he was given a masterful ride by 22year old jockey Oisin Murphy. He broke well and strode into the lead setting a decent strong even pace. On the home turn all the horses behind were in trouble and he ran out a comfortable winner by 4 lengths. In the process he beat the first three home in the French Derby including the Derby winner Study of Man. This was an awesome performance and showcased Harry’s talents as a patient trainer and all the hard work the team at home had put in over the last few months. Knight to Behold has returned fit and well and may now be aimed at the Prix Dollar Group 2 at Longchamp on Arc weekend. Not to be outdone JACKFINBAR (3yo) travelled to Longchamp to contest the Prix de Lutece Group 3 over 1m7f. Ridden by Jim Crowley this son of Whipper was given a lovely lead by the French pacemaker, made his move on the home bend and won impressively by 2 lengths from Listed winner Ziyad with another 9 lengths to third placed horse Mystic Sunshine. This was a brilliantly bit of placing by Harry and he will now be aimed at the Prix de Chaudenay Group 2 on Arc weekend over 1m7f for 3yos only. It is hard to believe he was the last of Harry’s yearling sale’s purchases to sell! This was a first group winner for owner Kevin Freeman and his family who have been so supportive. JUST AN IDEA (4yo) returned to one of his favourite tracks Chepstow and under an inspiring ride by Nicola Currie made it a winning visit much to the delight of his loyal owners. With plenty of rain falling he made a quick return to Wales where he finished 3rd in a higher rated race. One of the smallest horse’s in the yard but certainly one of the biggest hearts. STAR GYPSY (4yo) ran a very encouraging race when 3rd over 1m at Kempton Park. PACT OF STEEL (3yo) ran a great race when 2nd at Wolverhampton. BALLET RED (2yo) followed up her 2nd at Kempton Park with 4th at Windsor and then 2nd again this time back at Kempton Park. A gusty filly who keeps trying her very best. She has French Premiums and may soon by crossing the channel to plunder some euros. GOLDINO BELLO (2yo) ran a cracking race on his first trip to Deauville going down by four noses in a blanket finish yet still picked up £2,500 in prizemoney. If he’d had drawn the rail rather than the centre of the track, he most likely would have won. Lovely colt by French first season sire Anodin bought at the Arqana Breeze up sales in May. ROBIN OF NAVAN (5yo) had a well earnt mid-season break after three runs in quick succession and looked for a moment he would play a leading part in the Group 3 at Deauville when just tiring in the final half furlong. He needed the run and has returned in great shape. Looking forward to Autumn campaign. Many have asked for information on the memorial service for John Dunlop. The Thanksgiving service will be held on Wednesday 19th September 2018 at 2.00pm at St Paul’s, Knightsbridge and everyone is welcome. Currently the majority of owners here at Windsor House Stables carry the SiS logo under the LTA agreement which enables VAT to be reclaimed off racing expenses. This agreement is due to run out at the end of August. The Lambourn Trainers Association is in talks with a possible new sponsor to cover all members of the LTA but if anyone has a company who might be interested in sponsoring Harry Dunlop Racing and would like to see their logo on the silks around at various race tracks please do get in touch with Jenny in the office on 01488 73584 / info@harrydunlopracing.com. We have been assured that even when it runs out we will still be able to reclaim the VAT whilst searching for a replacement. The cost is £100 per horse paid to the owner via Weatherby and the production of the logos to go onto the silks and any other branded clothing. And they’re off……the Arqana sale ring in Deauville was buzzing with high prices for well bred horses. Everyone is invited to attend the annual owner’s day to include Parade of Horses & Yearlings followed by Lunch. This is a great opportunity to see friends, make new acquaintances and view the current champions and see possible champion of the future. More details to follow. DUNLOP LAUNCHES ANOTHER SUCCESSFUL RAID WITH JACKFINBAR Harry Dunlop made another successful raid to France, following Knight To Behold’s Gr.2 Prix Guillaume d’Ornano success last month, when Jackfinbar landed the Gr.3 Prix de Lutece. The son of Whipper tracked Solesili (Dansili), who set a good gallop and had the field well strung out. They closed in on the pacemaker before the turn for home and after it Jackfinbar kicked on, followed by Ziyad (Rock Of Gibraltar). Ziyad appeared to be travelling better but Jackfinbar kept on finding ran on to score by two lengths. They were nine lengths ahead of Mystic Sunshine (Maxios). A winner over 1m1½f at two, Jackfinbar was unsuccessful in three starts this season before scoring in a 1m6f handicap at Sandown Park in July on his last start. Bred by Larissa Kneip and Sandrine Grevet, he is a full-brother to the Listed Silver Tankard Stakes winner ann Gr.1 Criterium de Saint-Cloud runner-up Willie The Whipper and a half-brother to the German Listed-placed Anna Magnolia (Makfi), a half-sister to the Gr.2 Union-Rennen winner Aspectus (Spectrum). Knight To Behold wins Group 2 at Deauville under Oisin Murphy! With temperatures regularly recorded over 30 degrees in Lambourn a massive thank you must go out to the staff who haven’t wilted from their work and have ensured all horses have been kept as comfortable as possible. The staff also have been kept hydrated with regular cold drink deliveries and the odd ice-cream or two! The warmer weather certainly hasn’t affected the Harry Dunlop winning formula with FLIGHT OF FANTASY (4yo) making all at Newbury over 1m2f to the delight of her owner/breeder Peter Deal and the family of the late Gerry Lowe. It was lovely to see this handsome daughter of Nathaniel record yet another win. On his last run JACKFINBAR (3yo) was just denied on the line a winning debut in France and this time made sure that it wouldn’t happen again when running out a clear winner of a valuable race at Sandown over 1m6f at 25-1 the outsider! It was great to see Kevin Freeman’s colours in the winners enclosure. GOLDINO BELLO (2yo) had showed some promise on his start at Ascot and was an impressive winner over 6f at the Newmarket July course on only his second start. This good-looking son of first season sire Anodin who was 2nd in the Breeders Cup Mile, was purchased at the Arqana May Breeze up 2018 sale. SPACE TALK (3yo) travelled to Haydock where she ran another brave race to finish 2nd again. The evergreen JUST AN IDEA (4yo) returned to action with an encouraging 4th at Kempton Park. He then ran at Glorious Goodwood where the ground wasn’t quite soft enough but he was running on well at the end. ROMAN WARRIOR (3yo) ran twice during July and both times finished 2nd at Kempton and Chepstow. WILLINGFORSHILLING (3yo) ran at Lingfield Park where she finished 3rd over 1m1f. The Windsor House Stables Partnership horse GOLDEN IMAGE (3yo) gave them plenty to shout about when 2nd over 1m4f at Salisbury. One of the all-time yard favourites EARLY MORNING (7yo) has been retired from racing. He was looked after throughout by the most dedicated of stable staff, Phil Donnelly who experienced every possible emotion with this horse over the last 6 years. EARLY MORNING ran 30 times over 7f-1m, 18 turf / 12 all-weather with a highest rating of 107 and won over £85,000 prizemoney. When he arrived in the yard he was a rangy dark grey with a big knobbly head. At 2yrs he was placed twice from 3 runs. He then ran twice at 3yrs and was placed twice before breaking his leg at the end of an exercise on the gallops. It was a complicated break but combined with his amazing temperament, bravery and excellent medical care from Donnington vets he made a full recovery. At 4yrs in April 2016 he made it a winning return to the track. He then went on to win and be placed in more races. Whilst away on his winter holiday he developed he life-threatening condition Colitis. He then found himself back at Donnington Vets, Newbury where he spent weeks in intensive care. Phil visited him every single day making sure when he felt better there with an endless supply of extra strong mints. Again his will to live saw him survive an illness that normally proves fatal. He returned to Windsor House Stables for his rehabilitation. This extraordinary horse not only survived but the following Spring returned to the track where again he won causing many happy tears. Now aged 5yrs he took part in the international jockeys’ race meeting at Ascot, The Shergar Cup. Ridden by Hayley Turner they slipped the field and won the race to the roar of a hugely appreciative crowd. He raced at 6yrs and continued to win and be placed. He also travelled to Deauville where he added valuable Black Type in a Listed race. At 7yrs he still showed plenty of enthusiasm and was placed but his owners took the sensible decision to retire him whilst he was in good health and sound. He is now having a holiday with a view to go into a retraining program and then a suitable loan home will be found for him. His now distinctive pale grey body will be missed trotting though the village by many who would pop into the yard just to see him. He was always one of the most popular horses at the Lambourn Trainers Open Day. It has been an honour to have had him for his racing career and we all wish him a long and very happy retirement. Part of the Racing Welfare Staff Stable week celebrations saw two staff flat races. One was a Doncaster and the other at Newton Abbott. Malcolm & Alicia Aldis were very generous and allowed our Pupil Assistant, Rachel Davies, to ride their homebred super star STORM ROCK in her first ever race. The distance was a bit far but both jockey and horse returned home with huge smiles and a very well ridden 5th place. Rachel also raised over £800 for Racing Welfare. Thank you for the wonderful uplifting messages & cards of support offered to Harry since the news of John’s death. They have brought much comfort and have been hugely appreciated. As many of you will have read in the papers and seen on the TV, John achieved some extraordinary race results and was a pathfinder for foreign racing. But it was what he achieved behind the scenes that so many people will be forever grateful to him. His immense work for the Stable Lads Association was unparallel. He was one of the key men who saved the Grand National. He was also a countryman at heart with a passion for livestock. He was renowned for his excellent eye when judging Show hunters and was equally successful in sourcing future Horse of the Year champions. His Beef Short-horn herd were constantly in the ribbons throughout the 20yrs he bred them from his base in Arundel. He inspired immense loyalty from his staff and this was shown with great affection when over 70 old employees attended his funeral last Friday. A Thanksgiving service will be held on Wednesday 19th September 2018 at 2.00pm at St Paul’s, Knightsbridge and everyone is welcome. 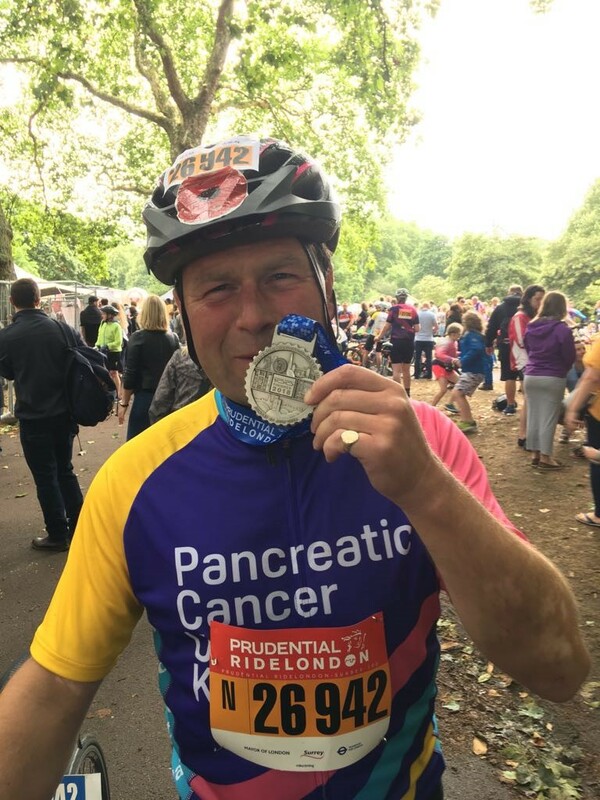 This year Harry took up the challenge to complete the gruelling 100-mile cycle ride known as the Prudential Ride London-Surrey 100 to raise monies for Pancreatic Cancer UK. Throughout the long wet winter he was a regular sight in high viz lycra pedalling up and down the hills of Lambourn Downs. With the help of members of Velocity Racing he took part in some Sportive cycling events slowly building up the miles. After six weeks of sunshine and not even one spot of rain race day dawned and along with it came stormy winds and sleeting showers! This though did not deter our intrepid peddler and along with 22,000 other lycra clad friends he competed 100 miles taking him through south London to Epsom and the notorious Box Hill in Surrey. The finish was up The Mall. Christina and the boys were on hand to cheer him over the line. To date he has raised almost £10,000 with donations still coming in via his Just Giving page. An enormous thank you to everyone who has supported him whether it be financially, practical advice, training sessions, or moral boosting, it has all be hugely appreciated. JUST ANOTHER IDEA 3yo half-brother to two Black type horses Just An Idea & Staisenzapenzieri. Made eye catching debut at Kempton Park. This is a 10-share partnership. Only a couple of shares left. GOLDEN IMAGE 3yo filly already a winner this season at Salisbury and placed 4 times from seven runs. Leased to Windsor House Stables Partnership where the emphasis is on having fun. If you’d like to have a horse in training for 2018/19 season and savor that winning feeling Harry will be attending the sales and would be delighted to advise and answer any questions. Harry with Tom & William at the finish line on Sunday! I completed the Prudential 100 mile bike today in very tough and pretty wet conditions and I would like to thank everyone who has sponsored me and raised money for Pancreatic Cancer UK, I think we are on the way to raising £10,000! The month of June saw runners at Royal Ascot, The Epsom Derby, the Irish Derby as well as a Double. It is every trainer’s dream to win the English Derby and this year Harry had his first runner KNIGHT TO BEHOLD (3yo). This stunning son of Sea the Stars had won his trial in eye-catching style and went into the race with plenty of positives. He broke well and was in a handy position to tackle the hill but soon became involved with the O’Brien pacemaker where he was harried all the way up the hill and round Tattenham Corner. It was impossible to keep this pace up and last out the distance and at the 1m2f we knew our fate. He finished in the rear and was very tired post-race. On reviewing the race, it was felt that for his next run he would be ridden a little differently. Royal Ascot came too soon for him and his patient owner/breeder Mr Neil Jones and Harry agreed his next target should be the Irish Derby over the same distance held at the Curragh. He travelled over to Ireland overnight on the ferry to avoid the heat of the day and took the journey extremely well. The ground was riding fast but safe and the staff at the Curragh must be congratulated on producing such a good surface despite the heat and strong drying conditions. Frankie Dettori rode him. Again, jumped well and soon into stride with Frankie using his skills to keep his enthusiasm in check. About a furlong out it looked like we were in for a shout and overall, he was beaten 10 lengths. Frankie reported that it might be time to drop him back to 1m2f and build from there. Lots of positives from both races with the horse gaining valuable experience each time. The media support and good luck messages were overwhelming and hugely appreciated by everyone at Windsor House Stables and it won’t be long before this lovely colt is back in the winner’s enclosure. Royal Ascot lived up to all its hype and provided an amazing week of racing. FIGHTING IRISH (3yo) was the first ever Royal Ascot runner for his owners Daniel MacAuliffe and Anoj Don. This gusty son of Camelot ran in the Commonwealth Cup Group 1 over 6f. Some of the biggest names in European sprinting took part. Fighting Irish ran a huge race to finish 8th / 22 runners beaten just over 2Ls by the winner and claimed the scalps of Invincible Army, Equilateral, and Sioux Nation. If a horse at the end hadn’t crossed him in the dying strides he would have been even closer. The jockey reported that if the ground had been easier he could have been in the top 3. Quite an achievement! France and better ground now beckon. At the end of June from 39 horses 6 horses are now rated over 90 – EARLY MORNING 99, PIRATE KING 92, JACKFINBAR 91 with three rated over 100 – ROBIN OF NAVAN 110, KNIGHT TO BEHOLD 110, FIGHTING IRISH 106. This is some achievement from a small yard. June also saw a spectacular across the card double win with GOLDEN IMAGE (4yo) giving the Windsor House Stables Partnership plenty to shout about when winning at Salisbury. This was a fabulous result also for her breeder Judy Maitland Jones. This filly has been part leased to the partnership after their other filly was unable to race this year. This was her first start for the team and they celebrated in style! (See below for shares available). Then 20 minutes later the half-brother of Dandino, PIRATE KING (3yo) won by 8 lengths at Doncaster only his third start. This colt is by Farrh who is producing some exciting offspring. He looks a lovely stayer in the making with still some maturing to come. With the ground conditions getting dryer and faster the all-weather is a very useful alternative. BALLET RED (2yo) made her racecourse debut at Kempton Park where she just failed by the narrowest of margins to win. A wonderful start to her career and gave her owners the Ascot 9 lots to dream about. JACKFINBAR (3yo) ran a big race at Sandown over 1m6f where he was just out of the frame. Feeling fresh and well he then travelled over to Compiegne, just north east of Paris, where he was just denied on the line to finish 2nd. He ran another super race and is getting better and better with each run. Seconditis seemed to be the theme for this month with SPACE TALK (3yo) just beaten at Wolverhampton. She has now run 3 times and been 2nd twice! JUST ANOTHER IDEA (3yo) brother to JUST AN IDEA made a very pleasing racecourse debut at Kempton park and would have learnt plenty from his experience. One or two shares are still available in the Windsor House Stables Partnership. Leased from Mrs Judy the remainder of the 2018 flat season. GOLDEN IMAGE (3yo) was a winner at Salisbury on her latest start last month and due to run very soon. She has now won and been placed three times from 6 runs. The partners get a share of the prizemoney and visits to equine places. It is hard to comprehend but August will see the first of the European yearling sales. If you’d like to have a horse in training for 2018/19 season and savor that winning feeling Harry will be attending both sales and would be delighted to advise and answer any questions. It was with immense sadness we heard the news about the sudden passing of Gerry Lowe. Gerry was a co-owner with Peter Deal including winning filly Flight of Fantasy (4yo). He was a charming person and a great racing enthusiast. He will be much missed by many and our thoughts are with his family. When Harry spent 1,500gs on a Red Clubs small bay filly with big ears and very little pedigree little did he realise what joy she would bring to so many owners. Bought for the Harry Dunlop Racing Partnership she won at Leicester over 6f on firm ground and was placed a few times. When it was time to sell she was bought for £3,000 by half the members as their first broodmare prospect. Headed up by Heather Royle she was sent to first season sire Showcasing where she produced a good-looking colt. At the foal sale he realised a staggering 82,000gs. He was then resold by his buyer as a yearling for £170,000 at Goffs UK Premier sale to Shadwell Stud. They named him Waqaas. He went into training with C Hills and ended up a winner and Group 2 placed. Her next colt was also a winner. She had two more colts both waiting to make their racing debuts. Sadly she died of colic two months after producing her first filly by Adaay. This much-loved mare will be hugely missed by her devoted owners and showed that anything is possible owning a racehorse and nothing is predictable. The velocity Racing syndicate were treated to a long weekend's worth of cycling and excursions including the Chantilly training centre, a trip to the races and a visit to Monet's Garden. Harry is looking forward to next year's trip! FLIGHT OF FANTASY produced a strong staying performance from the front under Keiran O'Neil. A two-time winner over 1m4f in her career, she had plenty of early use made of her and responded gamely to pressure in the final quarter-mile to repel all challengers. We were delighted by the way she won and hopefully you will see her out again soon.